Bruce Greene is a Western painter who has ridden trails and experienced the cowboy life he portrays in the very narrative images he creates. The artist is a native Texan who has reached the pinnacle of his profession through hard work and an extraordinary talent for painting the story of one of our country’s most revered icons, the American cowboy. His scenes of contemporary cowboys going about their daily work are admired and collected across America. One of Greene’s most enjoyable, recent projects was creating a painting for the Texas Rangers Association Foundation commemorating and honoring the history and high standards of the Texas Rangers. 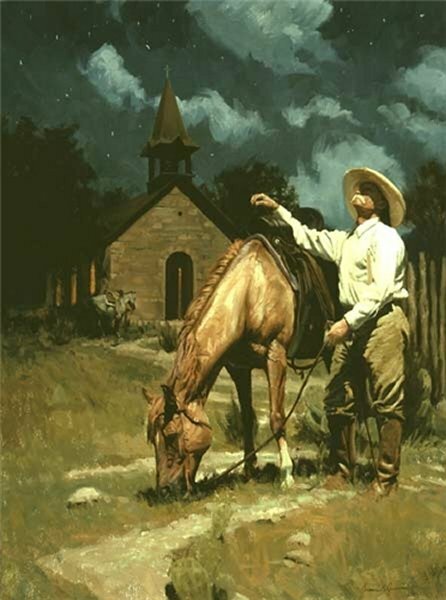 The painting, titled “The Ranger Code,” was purchased by members of the Foundation’s board and is in the permanent collection of outstanding Ranger art at the Texas Ranger Museum in Waco. Greene was elected to membership in the prestigious Cowboy Artists of America in 1993 and served as its President in 2003. The artist and his family live on a small ranch in the historical community of Norse, near Clifton, Texas. Greene’s studio sets on the edge of a hill behind his home. From this vantage point, large north windows offer a continuous view of the Texas Hill Country, a few Hereford cows, and the occasional whitetail deer. “It is a wonderful blessing to be able to make a living for my family doing what I love in this beautiful place,” says Greene. Greene’s works are represented by several well known galleries in the Southwest. He has presented his art in annual shows and exhibition such as the Cowboy Artists of America Exhibition, the Prix de West Show at the National Cowboy & Western Heritage Museum, and the Autry Museum of Western Heritage Sale, just to name a few, and other prestigious venues.